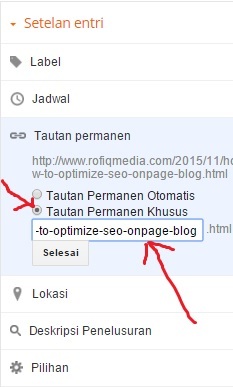 onpage seo optimization for blog is actually very easy if you already know the secret . Unlike the Offpage optimization , even though you already have the knowledge , execution would still be difficult to do. Have you understood what onpage seo ? Optimization SEO or Search Engine Optimization is a term in onpage SEO, which refers to everything that you do on the components of a web page . The main objective of this onpage seo optimization is to improve the onpage SEO factors that search engines get the emphasis right keywords from a page . The better way of optimization seo onpage blog will have a better chance of appearing on the first page in search engines like google and very important as a strategy for a blog to become popular , and also must be owned by a blogger , especially for us who are just starting to register a blog by writing unique content relevant to use a design template seo friendly , we all need to know about the attributes in order to improve seo blog , there are a variety of motivations for optimization seo onpage of making anchor links that lead or leading to the blog page of our article , insert makes alt image header tags are complete and also many others . Title Tag This is the first time immediately read by search robots , this tag serves as the main keyword index blog on search engines like google and bing , Title tags can also be equated called also the title of a blog or website . the existence of title tag is generally under the head . For title tag optimization seo onpage us in danger limit of 70 karater only for the placement of the word 's title tag. then how to optimize seo url link for more and better in the search engines ? how very simple if you already mengetahuinya.yaitu when you create an article , please click on the link permanent menu and click the link specific permanent. if the url is cut or not in accordance with the title , just add a word like that in the title of the article and in every space in the locker with a sign - instead of a space. and if you already know what I mean , please apply when you create an article , in order to better seo and increase the quality of your article. The title of the article is an attribute other template after attribute of the page title in the set , the existence of these attributes are usually marked with the code h2 for blogspot and also h2 used for the title of the sidebar , different again for wordpress usually use h1. in this case I will discuss another time why the use of H1 used for the title of the article in wordpress , so the conclusion tags are used to value the interest of the data to text so that the robot our blog quickly indexed search engine .So although the content is the same , but for each heading appearance only once , after all this time the application is absolutely no problem . Boldface or italic is also very important in onpage optimization . But do not need all of them , just the appearance of the first course in bold or italics . If too much can interfere with the readers of these pages . Essentially, make words with bold and italic print as needed , not too excessive. This optimization is applied to the image of the article. when you create an article , please click on the image and select Properties , then the contents of title text and alt text according to the keywords that you shoot. for example, as shown below.